Does your garage door make strange noises every time it opens? Does it creak, rattle or bang shut when it closes? These are the warning signs that it needs professional maintenance. Our professional technicians can come to you and conduct a full examination to check, maintain, repair or replace any parts to ensure your door is restored to reliable, top working condition. Creaks and groans are the first sign that something is off balance. Your garage door is a finely tuned machine, but over time, it can become unbalanced. Perhaps the pulley system on one side might be more effective than the other, perhaps some of the screws have come loose or one of the cable tracks might have bent slightly under the weight. For whatever reason, if your door is unbalanced, it can place undue pressure on the entire mechanism that will eventually cause some parts to break beyond repair. Call our professional maintenance servicemen to prevent or repair the damage at a fraction of the cost of replacement parts. 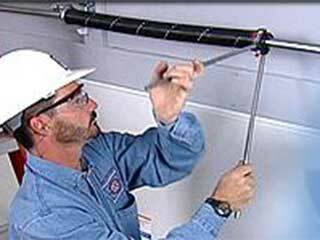 In most cases, when your door is unbalanced it either causes, or is caused by, dislodged cables or bent cable tracks. Either of these situations can place additional weight on your door cables that they are not designed to carry. If the problem is not addressed quickly, you risk more significant damage that can cost much more money to fix or even cause your door to stop working entirely. These two mechanisms are safety precautions that are legally required to prevent your door from crushing something, or someone, caught underneath. They include sensors that detect if any object is in the door’s way and even if the door is almost closed, will trigger it to reopen. Because these sensors are mandatory, we rarely hear of people being crushed by their garage doors these days, except in rare cases where the sensors, pressure or auto-reverse mechanisms are not in proper working order. Call for our professional maintenance services today because prevention is better, and cheaper, than a cure.